Fisherman's Rock is a large campsite north of Leyawiin containing NPCs (quest-related). 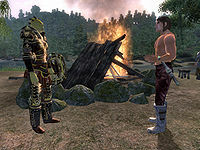 One of the largest campsites in Cyrodiil, Fisherman's Rock is located on the shore of the Lower Niben, a few feet southeast of Fort Redman. Looking south along the lake, the towers of Leyawiin are clearly visible and a look in the opposite direction will quickly reveal the walls of the neighboring fort. The camp contains four large tents with bedrolls and an enormous, eternally burning fireplace in the middle, surrounded by two stools and four mats. The tents contain a total of seven sacks, each containing clutter; they are all safe for storage. Surprisingly enough, the area is rather barren of useful plantlife, but down at the shore, behind two rocks that are arguably the namesake of the camp, sits a Nirnroot. During the related quest, you will arrive at Fisherman's Rock accompanied by a female Orc with an attitude problem, namely Mazoga the self-proclaimed knight. The camp will then be inhabited by a gang of mercenaries, led by Mogens Wind-Shifter. Mazoga, determined to avenge the murder of her friend Ra'vindra a long time ago, will walk right up to Mogens and confront him with past crimes. As expected, the entire camp will end up as a battlefield and you and Mazoga will leave four bodies behind. If you travel to Fisherman's Rock during the night (or if you sleep or wait there), the bandit from Fort Redman will occupy one of the bedrolls, preferably the one in the northwestern tent. This can also affect the related quest, as you may have one additional bandit to fight.